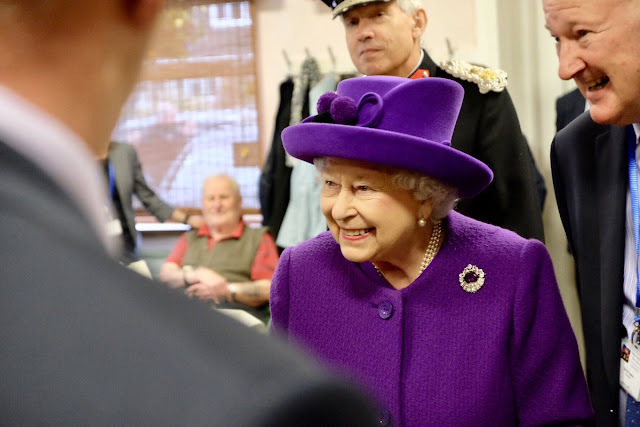 The Queen visited the King George VI Day Centre in Windsor to mark the 60th anniversary of the Centre's opening and the 70th anniversary of the Windsor Old People's Welfare Association. Longevity in action: The Queen opened this center for the elderly back in 1958 and gave permission to name it after her father; now she's visiting for its 60th anniversary and is herself older than some of the members she met there. Also purple in action, again! The Kent Amethyst is already on its third appearance for the year and we saw it on this same outfit (a coat and dress by Karl Ludwig and hat by Angela Kelly) in February.